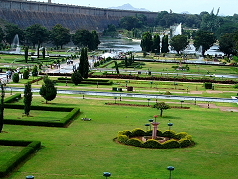 Brindavan Garden is located by the side of the Krishnarajasagar (KRS) Dam built across the river Kaveri. Though Brindavan garden belongs to Mandya district, it is very nearer to Mysore. Consider visiting this place from Mysore for a comfortable trip. Inside the garden there are many water fountains and during evening hours with the color full lights it looks fabulous. Plan your journey to reach the garden in the afternoon and wait for the lights to switch on. Video camera is not allowed inside the park but you can use any still camera by paying an entry fee of Rs 40 ( nearly USD 1 ). The distance between Mysore and Brindavan garden is 15Kms so you must include this in your one day journey plan. In total it will take 4 hours to return to Mysore with a comfortable stay of more than two hours inside the garden. Parking fee and entry fees are reasonable. Don't miss the musical dancing fountain which starts during evening and is the main attraction. A small flower garden and a mini acquarium are also available for visitors to see and enjoy. All kind of snacks and soft drinks are available in the garden. Boat ride available in the pond located in the garden. Visitors can cross the pond to reach the dancing fountain area by boat. The dam is also a road way for so many villages located at the other side of the catchment area. Sir.M.Vishweshwaraiah was the main Civil Engineer who pioneered the job during the (early 1930s) construction of this dam. The visiting hours for Brindavan garden is from early morning 7.00 am to night 9.00pm. Lighting will be on from 7.00pm to 9.00pm. People are to be careful only at the dam top side where they can see the vast area of water catchment. It is a joy to see the water flow from the gates to the other side when the dam is full of water. There is lot of opportunity for photographers in the garden to shoot. This is also one of the favorite shooting spot for film makers. There are so many buses available for travelling towards Brindvan gardens and return. 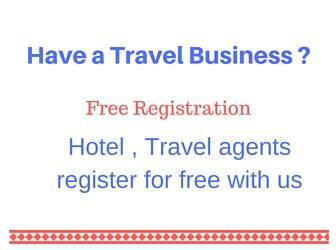 Visitors can avail the facility of trips arranged by so many agencies in Mysore. The parking area and reaching route to the garden has been modified and it is very comfortable for private vehicle users as they can reach the garden very nearer to the fountain place. There is facility for train also but visitors have to take taxi or auto to reach the garden area which is quite far away. This station is on the way to Hassan district from Mysore. People have to climb the steps to reach the dam top where they can see the water catchment area. Goddess Kaveri statue is located on the way. Public toilets are available at the entrance. Other places to visit around Brindavan garden is Balmuri located just on the way. People can also travel towards Ranganathittu Bird Sanctuary before visiting Brindavan gardens. Visit the Mandya home page to get the details of other visiting places and distances in Mandya district of Karnataka state.